The LoBiondo family moving into their new home. 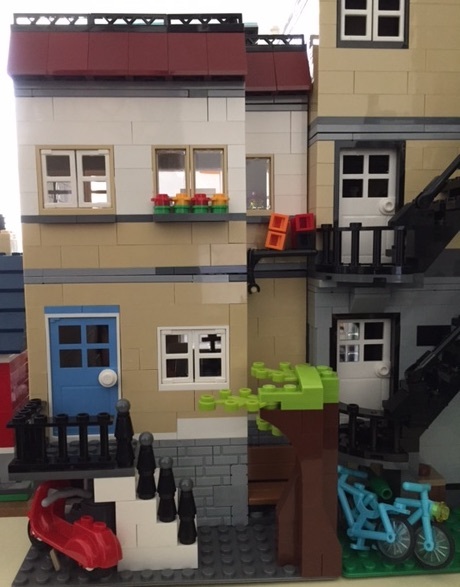 Shortly after I posted “Stalled,” the package of 1 x 2 connector bricks arrived, and I moved ahead on my townhouse MOC. I used the pieces of the Creator Park Street Town House for my custom windows and details, and followed the enclosed instructions to build the bed for the bedroom upstairs. I also built the sofa from the instructions, but decided it was too small to accommodate the family in my much larger living room, so I modified it with extra 4 x 4 plates. 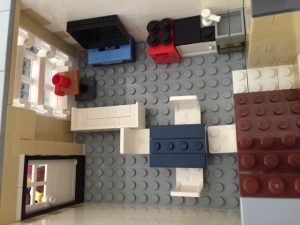 In all, the “official” Lego designs appear only in the bed, the front stoop, and the bench and tree that I’ve placed in the back yard. Otherwise, I cannibalized the set for its pieces and added many more from my collection. Downstairs features an extra large sofa, TV, kitchen, and dining area. 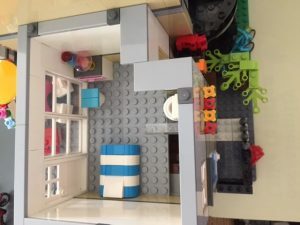 Unlike my Deli MOC, which originally only had interior furniture in the ground floor deli, the new townhouse is fully furnished except for the kids’ basement bedrooms. The main floor features a sofa, chairs, and table with a TV, a kitchen, and a dining table set for four. The upstairs bedroom contains a bed, a dresser (cannibalized from a Friends set that I used for the Lego launch of Jill Santopolo’s Sparkle Spa series), and a bathroom. 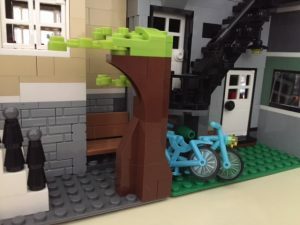 The MOC also has a patio in front with a table, umbrella, and chairs, and on the table is the ham sandwich that got away. With every MOC I build, one of the biggest challenges is what to do with the roof. Most of the Lego-designed Modulars have flat roofs with highly detailed eaves. It’s hard for me to find the pieces to match that level of detail, so in my previous MOCs, I’ve either gone for a more traditional sloped roof (the solution that the AFOL designer of the Market Street House also chose) or designed a building with more modern touches. For instance, my Radio Station MOC is a Bauhaus-inspired 1940s-style building in which simplicity is key. The rear of the townhouse has a shared clothesline. For the new one, the upstairs front patio already gives it a modern look, like so many older homes that new owners have renovated to fit their taste. And having seen Al Gore’s new film, An Inconvenient Sequel, while waiting for the connector pieces, I decided that the LoBiondo family’s renovation should include solar panels. Solar panels that face the front of the house to catch the sunlight more efficiently — and to demonstrate their concern for the environment to the other denizens of Little Brick Township. 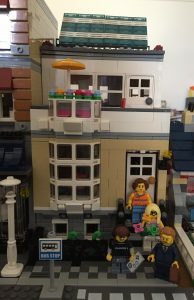 As a result, my name for this new build is the Solar Townhouse MOC. The LoBiondo family, with their daughter Trendsetter (her real name is Ashley) who has appeared in many of my Instagram stories and who lost custody of her chihuahua when she and Hipster broke up, have moved into their new home. 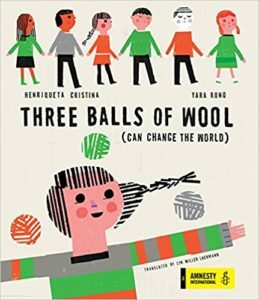 We hope they enjoy it and look forward to hearing more of their adventures. The bench and tree from the Lego Creator set have a new place.